While researching how citrus fit into the Rococo aesthetic, I found out that Versailles had a garden of orange and lemon trees. I love thinking about color in terms of temperature; after trying some cooler yellow palettes, I knew I wanted to bring more golds into this piece. You can see the original sketch below. 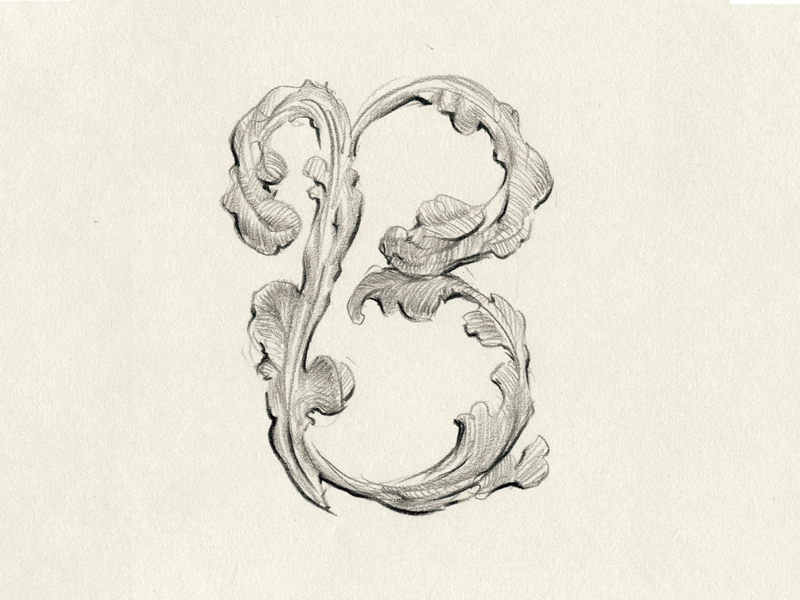 Gold leaf rococo custom lettering, hand-drawn in ink. Lettering of lyrics from Sara Groves' song, It’s Going To Be Alright. Lettering of lyrics from Sara Groves' song, From This One Place. Lettering of lyrics from Sara Groves' song, Like A Lake. I’ve been working in a lot of blues lately, and I’m so happy with how this piece came out. 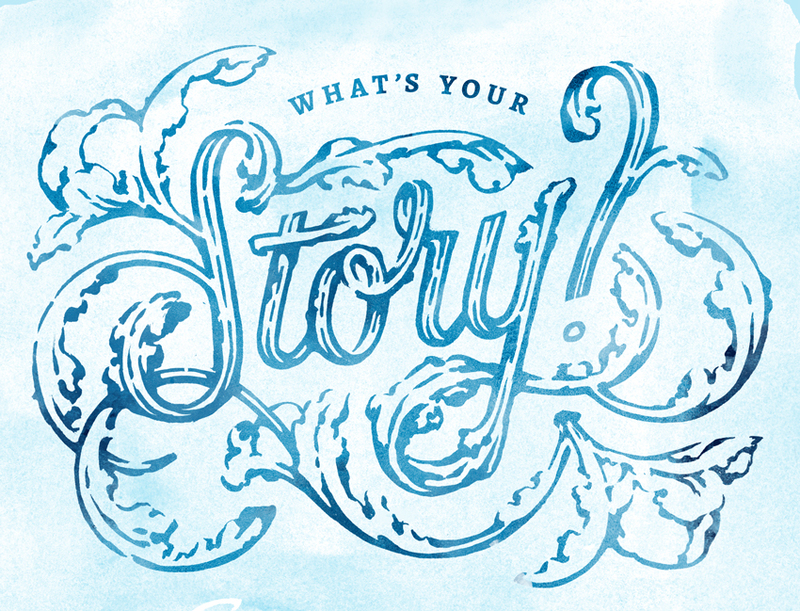 I paired this lettering that I created for a client with a portrait from a my sketchbook. Using deep indigo hues to offset the lighter, delicate florals made me think of wind and water. I got connected with Alejandra Linares when I spent time in Miami this year. Her tenacity and perseverance is inspiring. I love to see artists who are caring for their gifts and the creativity that gives them joy! Her linework is energetic and her recent color explorations on her instagram are beautiful and mysterious. Here is my interview with Alejandra! 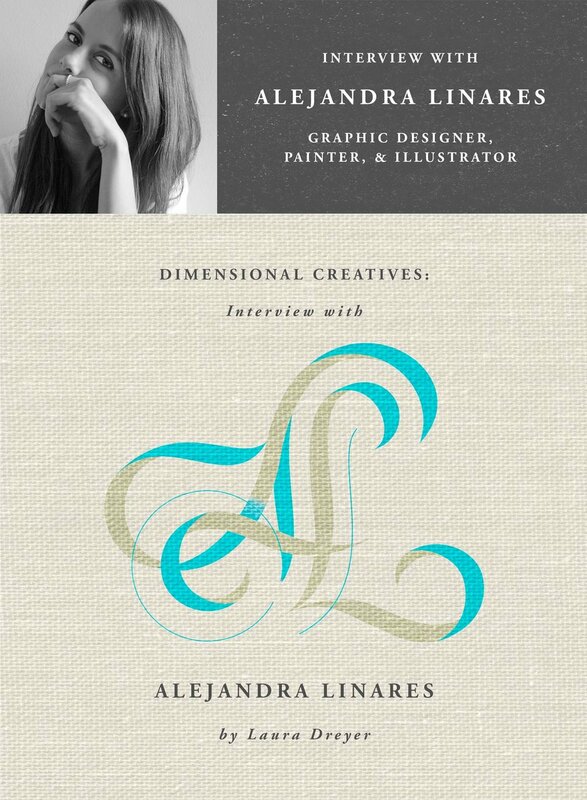 Alejandra Linares (AL): I do a variety of things, I’m a graphic designer, a painter and an illustrator. AL: When you can wake up every day and do what you love. As I grow older I realize that doing so it’s not something that happens to everybody, so I’m really grateful I can do this for a living. AL: Definitely, organized chaos. I purposely create some chaos in my artwork to challenge myself to see another way to approach my art and “re-organize” it. I feel if everything is too perfect and there are no room for mistakes, then there won’t be any room for learning something new. Growing up in Venezuela. In my country I’ve met the most amazing artist that inspire me to be better every day. My mom - she is an art teacher and was the first to teach me about art and her perception on it. Music - My whole life I’ve been surrounded by people that either love music or they are musicians themselves. Before I paint or start working on a project in my computer I always find a song that inspires me (and if I’m honest I play it on repeat until I’m done). AL: Simply by changing things around. I change my style of designing/painting quite often. When I’m doing digital projects (like my freshii illustrations or my don limon illustration) I tend to have a different approach from what I do when I’m painting on canvas. I guess is because each medium makes you feel different and therefore what you create is different. Imaginary Lines III. Original hand drawing on Canson Watercolor Paper by Alejandra Linares. 16 in. x 20 in. AL: To be successful, you must never give up. 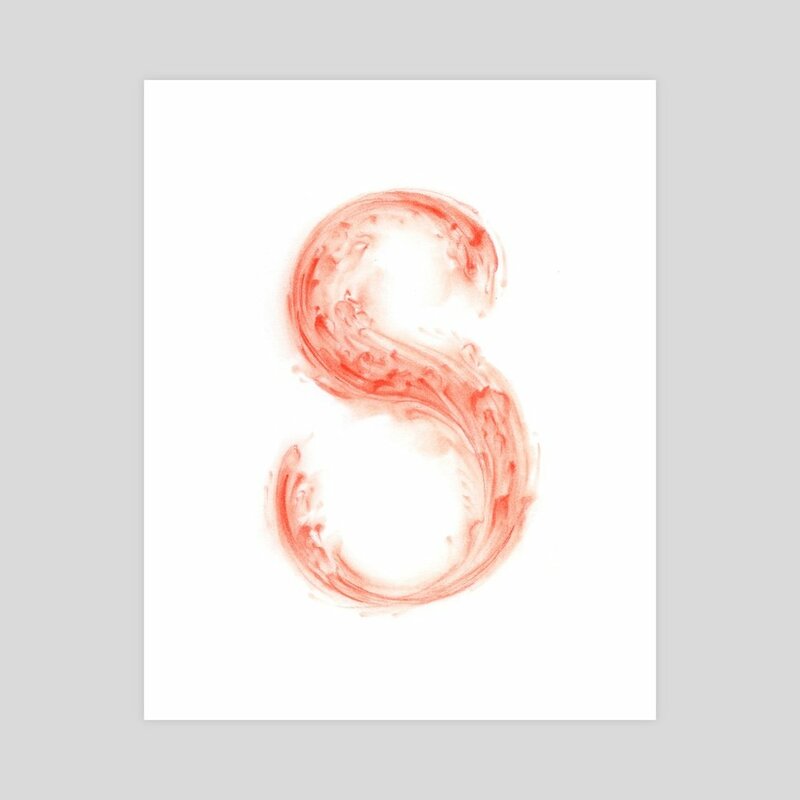 Monogram Letter S Print for Sale! My chalk S Monogram drawing is for sale in my shop! Prints for Sale! You see the process of how I made this piece here! Peter Pan Book Cover Drawing Process! 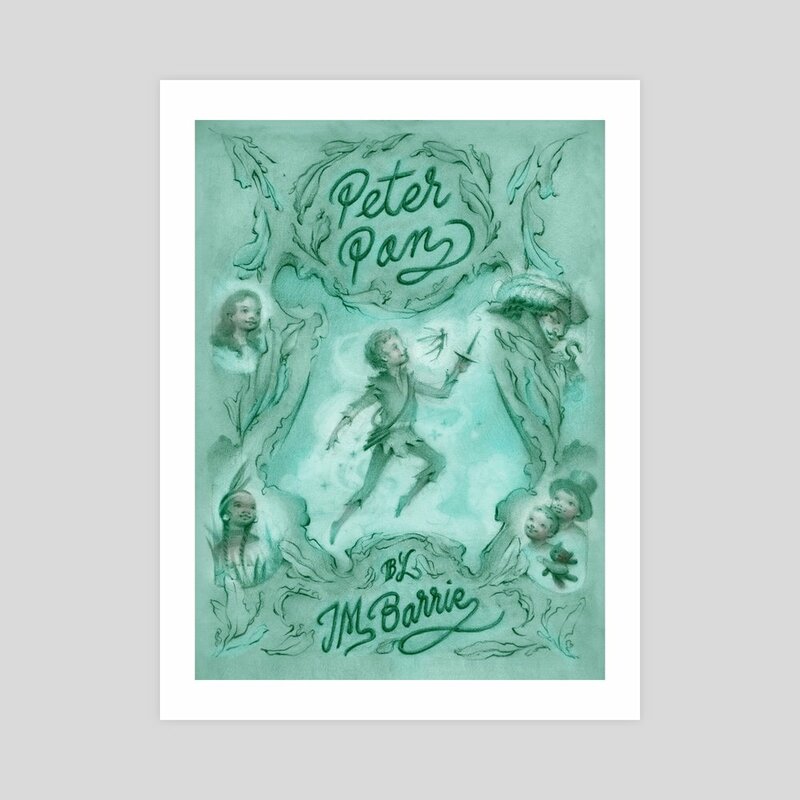 Here's a little look at the process of creating my Peter Pan book cover illustration! 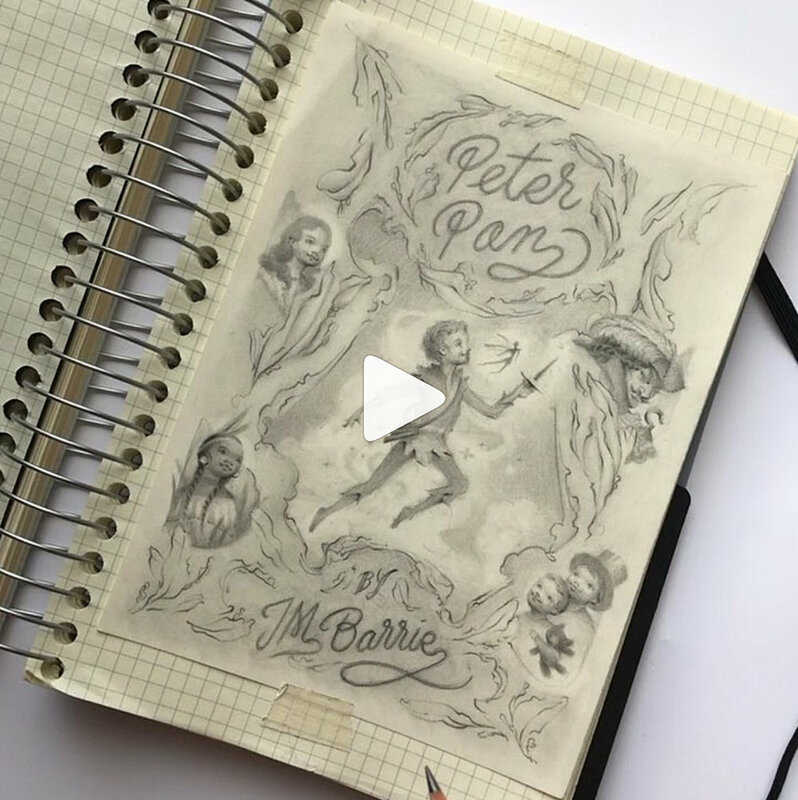 Video of the Drawing Process of My Peter Pan Book Cover! The Brown option looked a little too sandy or dry, so I liked the blue one better - it felt a little more smooth and moonlight! 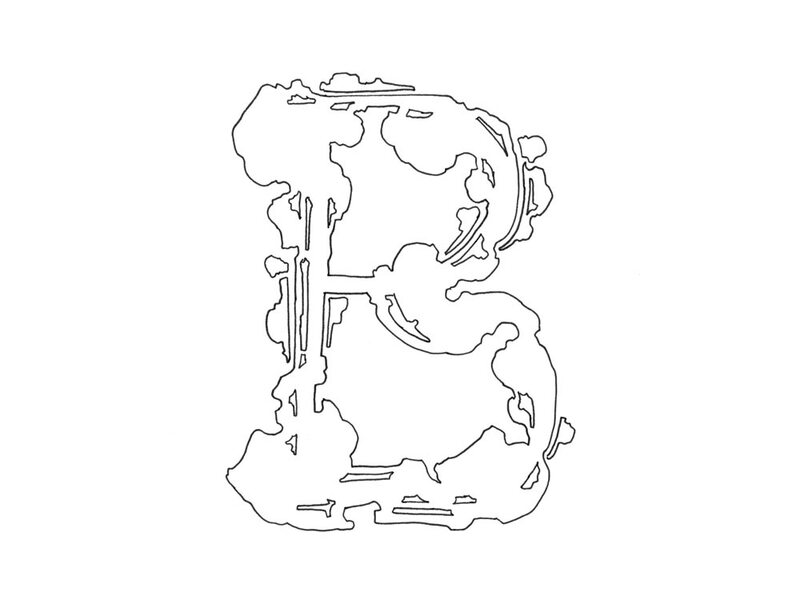 As I wrote in my last post about coloring my lettering drawings, I LOVE when two-dimensional art feels like a sculpture. I also wrote about how adding color can feel like it takes away from this three-dimensional, tactile feeling for me. However, adding color to this piece felt right! 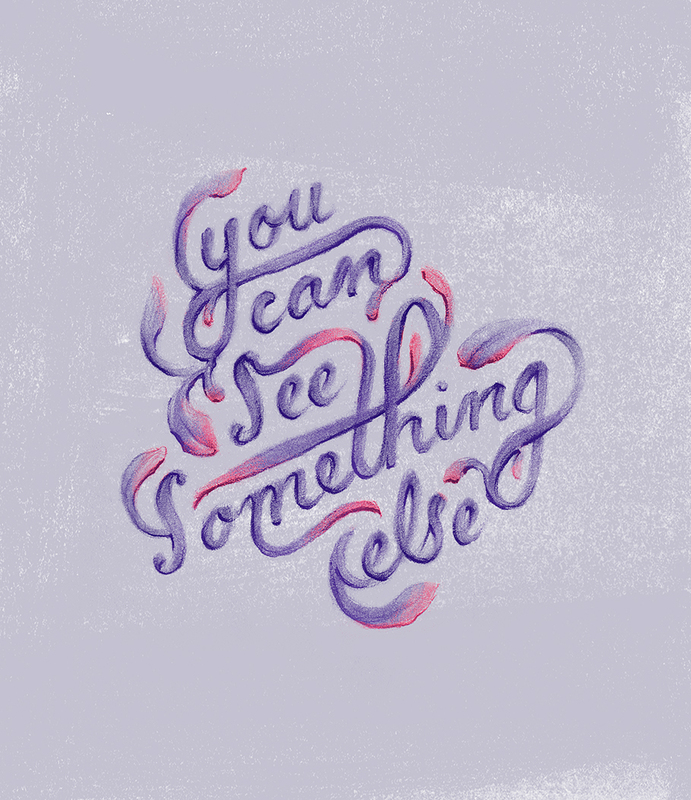 I wanted to use some "jucier" colors, like jewel tones—something that felt like a deep blackberry, or ink. Here's my process! 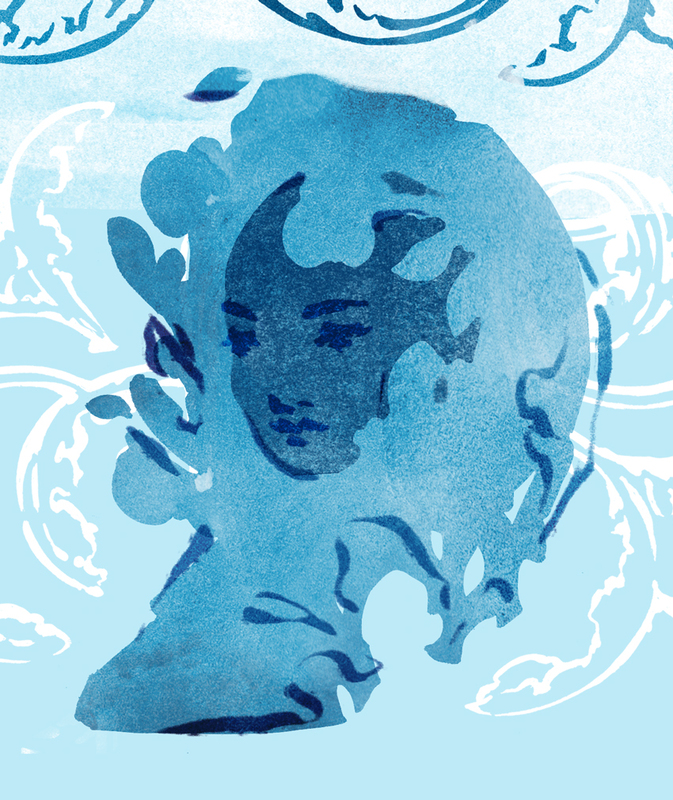 And then I added magentas to the linework on periwinkle background in photoshop. I didn't want to use the full range of values, because I wanted it to feel a little dustier and gentler than a deep, dark blue. Adding some pink (You know I had to!) brought out some subtle warmth to flesh tones, and I called it finished! You can see more of my dream portraits here! 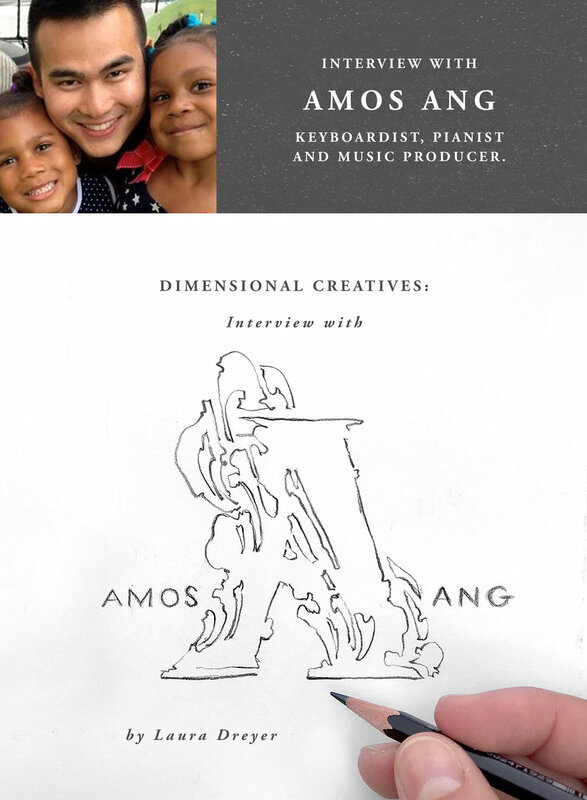 "Being Around Good People:" Interview with Amos Ang, Keyboardist, Pianist and Music Producer. Amos Ang is a friend from my NYC days. His makes people seen and heard, not only in his professional collaborations with other musicians, but also to the simple way he treats people on a day-to-day basis. I highly recommend you check out his music on Soundcloud! Amos Ang, Keyboardist, Pianist and Music Producer. Amos Ang: Keyboardist/Pianist and Music Producer. AA: Doing my best at whatever opportunity that comes my way. AA: Constantly surround yourself things that you enjoy. For me it's good art and being around people (mostly an extroverted person). Danikqwa and I met years ago in college where we were both studying design, and today she is living in Rhode Island, creating amazing embroidery pieces and working as a graphic designer. I love seeing her creating work that comes from her heart and the way it celebrates beauty. Read more in my interview below! Danikqwa Rambert, Embroiderer & Graphic Designer. 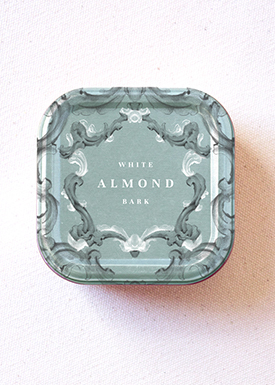 Danikqwa Rambert: By day I work as a graphic designer for a small woman-owned firm. 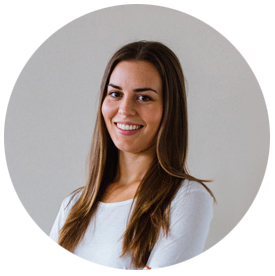 I enjoy working on a small team because I get to work on a variety of projects like branding, web design, and editorial layouts. Last August I launched Heart & Soul PVD, my online shop where I hand-embroider patches and design enamel pins. DR: In business, I want to be financially stable, but that is not the end all be all of my efforts. As an artist I want my work to resonate with others and make them think. At the end of the day I rest easier knowing that I gave my best effort in all of the work I’ve done. DR: I am an outgoing homebody for sure. I am not an introvert but I am very much a creature of comfort. I like to create work in solitude but at the same time I thrive off making genuine connections and meeting new people. Gardens/Greenery. Growing up I would watch my grandmother paint flowers from her garden. Peonies are one of her favorites, and they are also one of my favorite flowers to draw. The ocean. There’s just something about the smell of sea salt and the sound of waves crashing on the shore that make me feel at home. Handcrafted details. My grandmother, clearly a big influence in my life, has an “I can do that” attitude about almost anything that she can do with her hands. She has a love of cooking, sewing, building, gardening—you name it. Her appreciation for using her hands has given me a deep respect for objects of craft created out of hard work, attention to detail, and passion. DR: I keep joy in knowing that every effort, no matter how small, is a step towards improving my craft. While I do like experimenting and trying new things, sometimes I get bogged down when I’m in that “beginner” phase. I’m learning to get comfortable being a beginner. DR: My grandmother, who is also an artist and designer, always told me that there is no such thing as bad work, just opportunities to practice. This advice carries me through moments where I’m dissatisfied with the outcome of my work. She also told me to always use the best materials possible, because you never know when you just might happen to create great work. I think these two pieces of advice sum up the highs and lows of the creative process. Laura: I am amazed at the patience Danikqwa has for attention to detail. Her grandmother's advice of using the best materials possible also makes me think! I've definitely felt pressure in the past when I'm using more expensive media, but I like this idea her grandmother has. It feels like a good way to respect and expect inspiration. So cool! Thanks to Danikqwa for sharing her process and thoughts. Check her work out more at the links below! 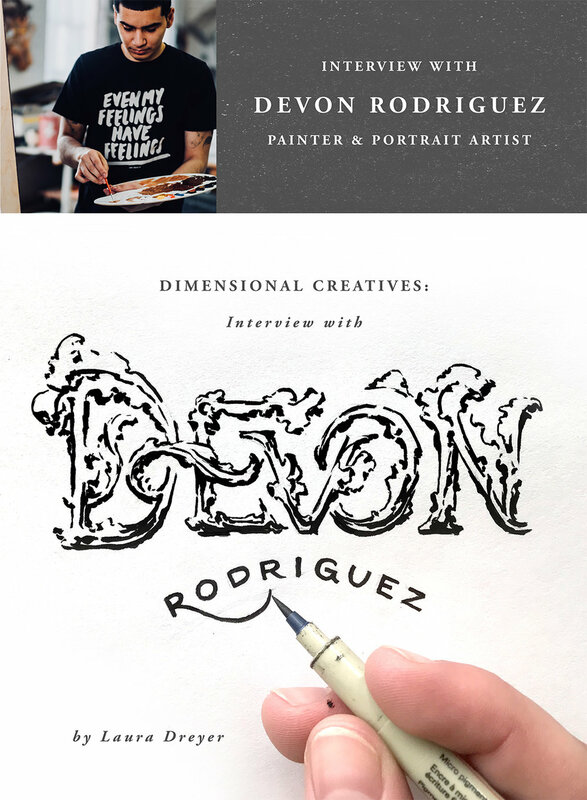 Today, I'm excited to share Devon Rodriguez, painter and portrait artist! Through mutual friends I have loved following his progression in capturing likeness and his unique viewpoint as a native New Yorker. His paintings remind me of my days in New York of eternal subway rides - sometimes meditative, sometimes mysterious, always very human. Can you believe he's only 21 and can paint like this? Enjoy! Devon Rodriguez: I document contemporary urban people with oil paint. DR: 6 years ago, success to me would’ve been to have the ability to paint a “realistic” portrait with a decent likeness. Now I’d say that success is to create a work that is profound and moves the viewer's spirit. DR: In one way, I want to create for just pure passion and joy. In another way, I want as many eyes as possible on my work. I think it’s a complex that many artists deal with. DR: At this point, just thinking about the fresh color on my palette brings me joy. I mean, sometimes it’s hard work, but that natural spark always comes back to me, always. Devon's commitment to the discipline of his art form gives me motivation to push through the creative blocks in my own work. Take a look at more of his work! Here's some lettering I recently made. I drew it in my sketchbook in pencil first, and then used a tortillon to blend and shade the graphite. I'm thinking of adding color digitally. What color should I do? There's something about being surprised that draws me to making things. Remember your first time, as a child, feeling the magic of cutting tiny pieces out of a folded white paper square and unfolding it to discover the surprising design of your beautiful little paper snowflake? 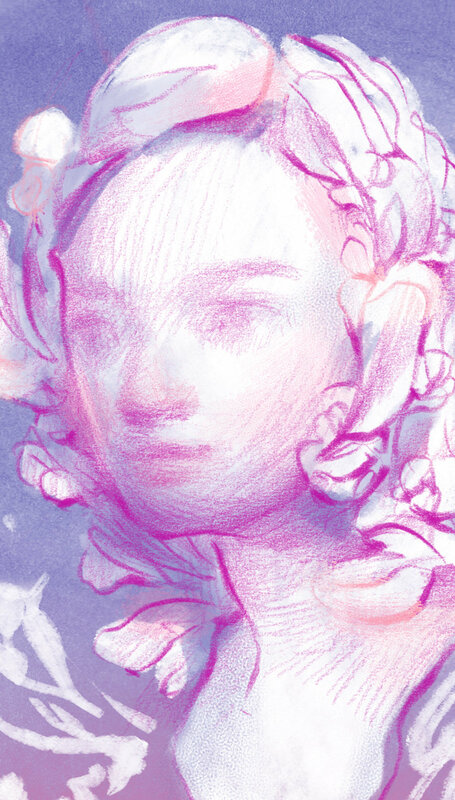 About four years ago, I found myself drawing frames made of flowers and rococo-inspired forms, but I rarely wanted to close the shapes. Something about only drawing half a frame allowed space for my imagination to play along with my hands - to jump ahead of my fingers and predict what it would look like reflected symmetrically. Making space for that element of surprise gave me such delight when I did reflect my drawings to create what I couldn't fully predict! Like pulling your new "experimental" recipe cookies from the oven, there were frames that didn't seem right - something was poking out too far or just "tasted weird," but there were also new notes and flavors that I loved! I believe allowing yourself to be delighted - or even disappointed - by what comes out of your hands when you sit down to make something is valuable, because it represents opening to something outside yourself. It represents risking disappointment for the opportunity of delight, and trusting that the future, though hidden, can be your friend in ways you won't see until it arrives. And that is how I want to live my life! See more of my frames here.